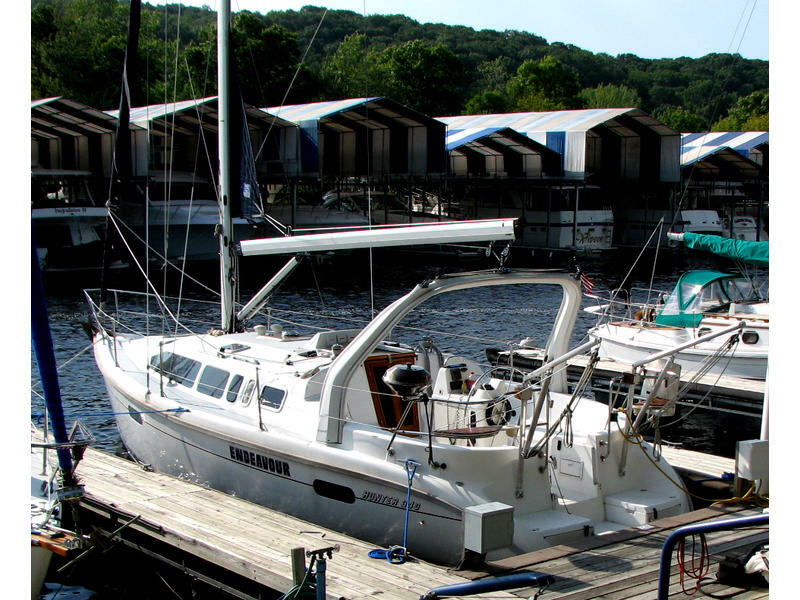 This late model Hunter is ready for day sailing, or extended cruising. She is an easy to handle vessel and can be easily single handed if necessary. There is loads of deck space, and a HUGE cockpit for socializing or sailing with friends, and her swim platform is easily accessed by her Walk-Through transom. The boat is in very good condition and quite clean with accommodations for 7 in a double forepeak cabin, queen-sized aft cabin and a settee and a dinette that converts to a double. The interior has warm teak woodwork that includes a navigation station with electrical panel display, a U-shaped galley with overhead shelf, and a head with separate shower stall. Counter tops are Corian in the galley and head. On deck she has wheel steering with auto pilot, roller furling genoa, roller furling mainsail, patented B&R rig with swept back spreaders and the boom is well above deck for headroom safety. The transom is walk through (hinged helm seat) for easy access to dinghy or a swim and there is a hot and cold pressure shower to rinse yourself off or clean up that spilled glass of wine. Managing a dinghy is a breeze with the sturdy dinghy davits and lifting tackle. This is a fresh water boat with fresh bottom paint. Non-Smoking Owners.